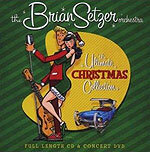 CD review: "The Ultimate Christmas Collection"
Brian Setzer, the one-time rockabilly wunderkid, has long inhabited an alternate universe in which rock 'n' roll didn't replace the big bands, but instead developed within the existing swing culture. His new Christmas album continues that seamless melding of early rock 'n' roll and swing  as if Elvis or Ricky Nelson were fronting the Basie band. Setzer and his stinging guitar leads are framed by the fattest horn charts you'll ever hear, and a female chorus backs both. Charmingly, Setzer's willing to put aside his rock inclinations from time to time in the interest of the big band. After opening with three hard-charging rock/swing numbers ("Jingle Bells," "In the Mood" and "Boogie Woogie Santa Claus"), he dials the mood way back on the fourth track for a Les Brown-infused take on Tchaikovsky's Nutcracker Suite. The most intriguing tracks would have to be "Angels We Have Heard on High" and "Bach's Bounce." Played about 50 percent faster than the norm, "Angels" moves from a straight-ahead jazz groove with the soaring theme played on trumpet to the purest rock 'n' roll with Setzer taking lead on his guitar, then moves into traditional choral territory, before switching gears back to rock 'n' roll for the finish. "Bach's Bounce" is a jazzed-up reworking of Bach's "Jesu Joy of Man's Desiring," with Setzer taking the lead on his hollow-body jazz guitar. It's hard to imagine anyone having more pure fun than Setzer in making music  and the fun is repeated on the second disc, a DVD with video of the band performing the same set as on the CD.